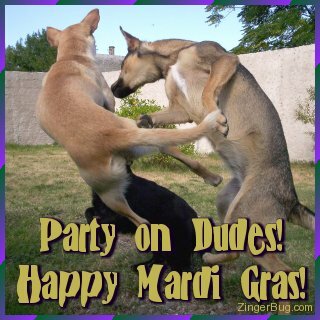 Happy Mardi Gras Comments and Glitter Graphics! Mardi Gras (or Fat Tuesday) is celebrated the day before Ash Wednesday which is the beginning of lent in the Christian calendar. It is traditionally a time of wild parties, costumes and celebration leading up to the deprivation of lent. Celebrate Mardi Gras with these comments. Laissez les bon temps roulez, y'all! These comments are perfect for posting on any social networking site or blog.